How do orthodox biographers imagine Shakspere of Stratford accumulating such “extraordinarily detailed knowledge” of warfare and military matters? Is it through automatic assimilation, by which all intricacies are miraculously absorbed into the very fiber of his being and translated into the dialogue of characters in his plays? At issue is “information” as opposed to innate genius – the former term defined (by my dictionary) as knowledge “communicated or received concerning particular facts or circumstances,” or otherwise “gained through study, research, instruction, experience.” The great author’s information about military life was not genetically inherited; it was acquired. He draws upon his wealth of information not in any calculated way but, rather, spontaneously, during the white heat of composition, and employs it for various purposes the way an artist will mix paints on his canvas. On and on come the military terms in the plays, as in 2 Henry IV, for example, with words such as alarum, ancient, archer, beacon, beaver, besonian, blank, bounce, bullet, Caesar’s thrasonical brag, caliver, captain, chamber, charge, cavalier, chivalry, coat, corporal. * Oxford’s cousins Horatio and Francis Vere, known as the “Fighting Veres” for their exploits as soldiers, may have been the models for the soldiers Horatio and Francisco in Hamlet. * Oxford’s brother-in-law Peregrine Bertie, Lord Willoughby d’Eresby, devoted his life to the political and military service of Queen Elizabeth. * When the Northern Rebellion of powerful Catholic earls began in November 1569, Oxford at nineteen requested military service, which was granted in the spring of 1570, when he served under Sussex. 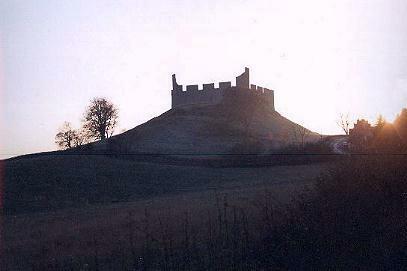 The chief action he would have seen was the siege of Hume Castle, whose defenders surrendered to avoid any further bombardment – an episode that calls to mind the siege of Harfleur by Henry the Fifth. * Oxford was champion of his first tournament at the Whitehall Tiltyard, in May 1571, performing “far above expectation of the world” in front of Queen Elizabeth and the royal court. He blazed his way “with fiery energy,” contemporary Giles Fletcher wrote, summoning “a mimicry of war” as he “controls his foaming steed with a light rein, and armed with a long spear rides to the encounter … Bravo, valiant youth! 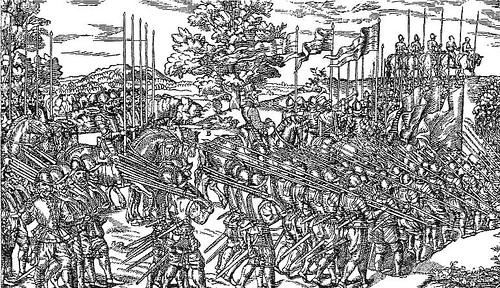 ‘Tis thus that martial spirits pass through their apprenticeship in war … The country sees in thee both a leader pre-eminent in war, and a skillful man-at-arms…” A decade later, in January 1581, Oxford prevailed as champion of his second and final such tournament. 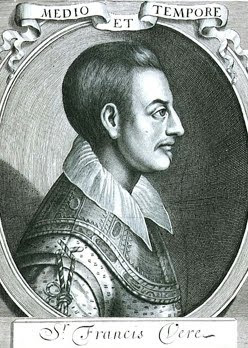 * The Defense of Militaire Profession was published in 1579, “wherein is eloquently shewed the due commendation of Martiall prowess, and plainly proved how necessary the exercise of Armes is for this our age.” It was dedicated by its author, Geffrey Gates, “To the Right honorable Edward de Vere, Earle of Oxenford.” The publisher, John Harrison, would later issue Venus and Adonis in 1593 and Lucrece in 1594, introducing “William Shakespeare” by way of the dedications to Southampton, with both narrative poems having been personally overseen by the poet. * Later that summer, Oxford (at age thirty-five) was commissioned to command a company of horse in the Low Countries. “Five or six thousand English soldiers have arrived in Flanders with the Earl of Oxford and Colonel Norris,” came one report in September. A month later, however, the queen commanded Oxford to return home and sent Leicester, who, having maneuvered his way into replacing Oxford, would proceed to disgrace himself by his behavior in Holland. How did “Shakespeare” acquire his military knowledge? The life of Oxford provides the most plausible answer. Immediately inside the cover page of The Defense of Militarie Profession is the coat of arms usually used by Oxford, with his earldom motto VERO NIHIL VERIUS (“Nothing Truer than Truth”) displayed along the bottom. De Vere not only acted as the writer’s patron, but also financed the publication; beyond that, he took great interest in this work and likely contributed a great deal to it behind the scenes. O what a noble mind is here o’erthrown! The expectancy and rose of the fair state! Edward Earl of Oxford was all that and much more. I don’t know how orthodox biographers imagine William Shakspere of Stratford accumulating all that “extraordinarily detailed knowledge” of warfare and military matters. Perhaps they see him acquiring it through automatic assimilation, by which all intricacies are miraculously absorbed into the very fiber of his being and translated into the dialogue of characters in his plays. On and on come the military terms in the plays, as in 2 Henry IV, for example, with words such as alarum, ancient, archer, beacon, beaver, besonian, blank, bounce, bullet, Caesar’s thrasonical brag, caliver, captain, chamber, charge, cavalier, chivalry, coat, corporal … well, you get the point. Also Oxford’s brother-in-law Peregrine Bertie, Lord Willoughby d’Eresby, devoted his life to the political and military service of Queen Elizabeth. * When the Northern Rebellion of powerful Catholic earls began in November 1569, Oxford at nineteen requested military service, which was granted in the spring of 1570, when he served under his great friend the Earl of Sussex. The chief action he would have seen was the siege of Hume Castle, whose defenders surrendered to avoid further bombardment. 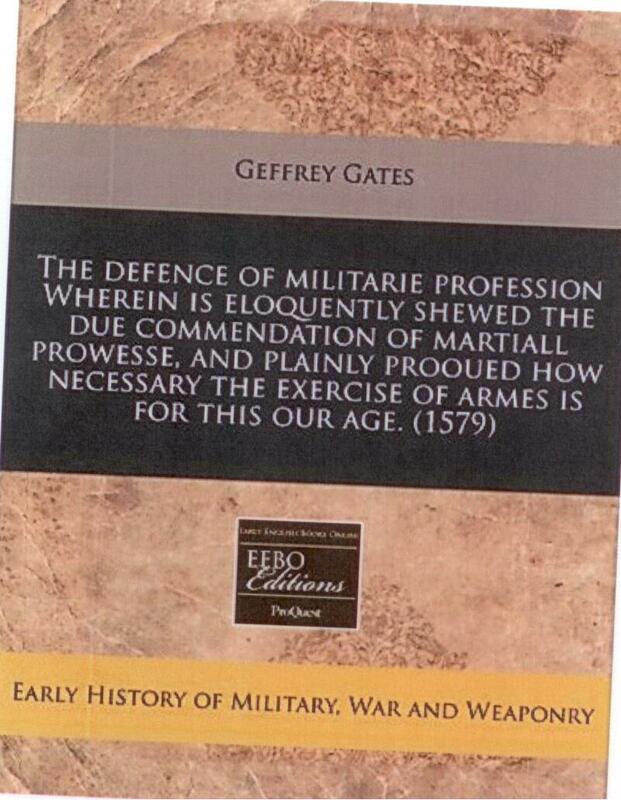 * An important book published 1579, entitled The Defense of Militaire Profession. 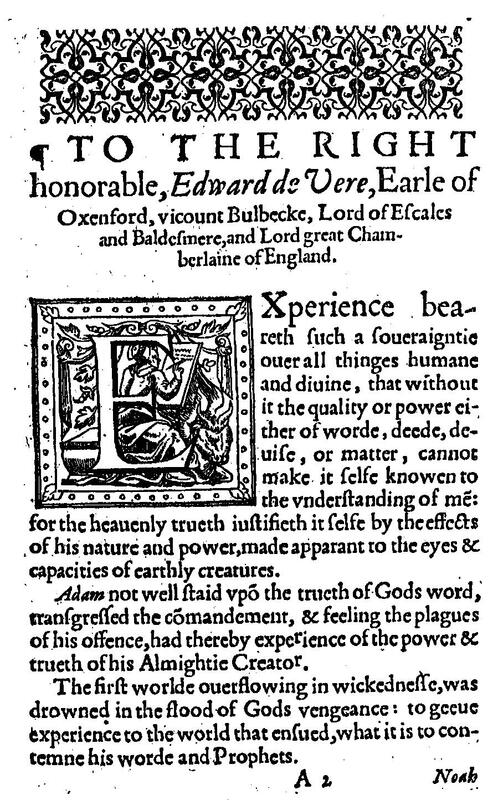 Wherein is eloquently shewed the due commendation of Martiall prowess, and plainly proved how necessary the exercise of Armes is for this our age, by was dedicated by its author, Geffrey Gates, “To the Right honorable Edward de Vere, Earle of Oxenford.” The publisher, John Harrison, would later issue Venus and Adonis of 1593 and Lucrece of 1594, thereby introducing “William Shakespeare” by way of their dedications to Henry Wriothesley, third Earl of Southampton. * Later that summer, Oxford at thirty-five was commissioned to command a company of horse in the Low Countries. “Five or six thousand English soldiers have arrived in Flanders with the Earl of Oxford and Colonel Norris,” came one report in September. 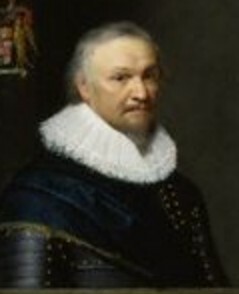 A month later, however, the Queen inexplicably commanded Oxford to return home and sent as his replacement the Earl of Leicester, who, having maneuvered his way into replacing Oxford, would proceed to disgrace himself by his behavior in Holland. How did “Shakespeare” acquire his military knowledge? The answer is Reason 51 to believe Edward de Vere was the great author.